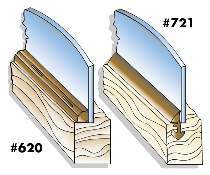 Vinyl retainer strip for holding panels, glass, or grills in doors and frames. Brown vinyl. #620 is installed with staples or nails. #721 presses in 1/8" saw kerf. 1/4"W. Sold per foot.